Here in Colorado, many homes have a basement. And when most people look at expanding the square footage of their home, they look to their basements. If you have a walkout basement, in many cases you can have a look and feel that matches your upper levels. But even if its tucked away with only a few garden windows, the usable space can still give you beautiful space you can enjoy for years. With basement space, however, there is usually one problem that can make you think twice about finishing it: water. If water has been a common problem, and has seeped into your basement more than once, do you really want to put effort into something that may be damaged? The most obvious spot to start with is the flooring. While other aspects of your basement are easier to save in the event of seeping water, the first area impacted is usually the floor. Is there a way to find a waterproof flooring choice, and have it be beautiful too? If you’ve sustained water damage before, the first step is to work with a contractor to eliminate as much of the problem as possible before finishing your basement. Yet basements are under ground, which means even if you have taken every precaution, there is always a chance for future flooding. Which means finding the perfect flooring that can take water. Some people may stick with good old fashioned concrete flooring. Concrete by far is a great choice at being waterproof and avoiding damage when contact with water is made. And with today’s choices of materials, concrete is no longer the boring choice it one was. That said, concrete is still a cold hard floor, which can make your basement not-so-livable on those cold winter evenings. Tile is an upgrade over concrete, and with the many sizes, styles and colors available, you can quickly make your home as elegant as you choose. You’ll find tiles in bathrooms and around pool areas with good reason – they handle perfectly in wet situations. 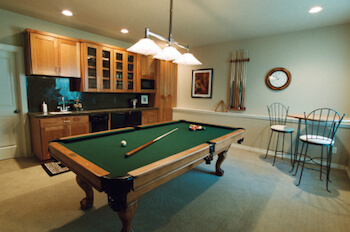 Which makes tile the perfect choice for a game room or living space in your basement. Today’s vinyl is not like you had in the home you grew up in. Today’s vinyl is luxurious and can take on any style you choose. Want a stone look? How about hardwood? There’s a vinyl choice for you. Plus vinyl has a cushion to it, making it a softer choice in homes with kids or elderly. Still love the look of hardwoods? Many people do. And while traditional hardwoods may not be the best choice for your basement, you do have options. Manufacturers like Armstrong make waterproof flooring options that bring the look of natural hardwood into the places you want it most – like your basement. And with its easy installation process, it can be a DIY project or have one of our installers finish your basement in no time.